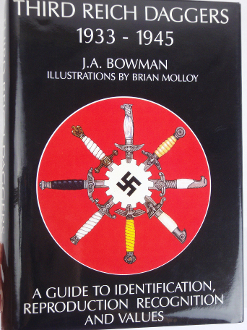 Book Details: This book serves as a reference and identification guide for Nazi Third Reich daggers, reproduction recognition and values. Jacket shows some curling and handling marks. The cover looks good, I saw no handling marks, it looks good. Nice book for the collector. Black & white illustrations. Measures 7 1/4” x 10” hard cover.